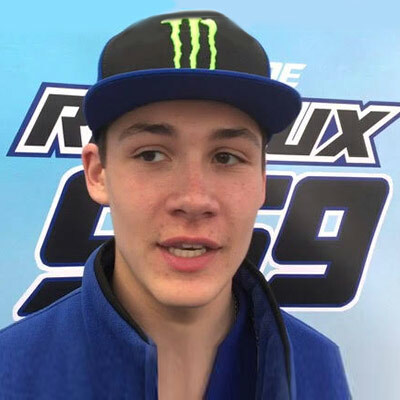 Maxime Renaux, born in the Ardennes, was introduced to motocross by his father when he was only four years old. At the age of 6 he took part in his first, Championship, Picardie 50 cm3. He won this race in 2007 (50 cm3), 2008 (65 cm3), 2009 (65 cm3) and 2010 (85 cm3), In 2012, Maxime continued his progression and won his first title of Champion of France Minivert at the handlebars of a YZ85. Maxime has started riding 125 cm3, at the age of 13, a great goal at that age. A few days after his 13th birthday, he competes in his first competition in the Junior French Championship. He also twice qualified in the EMX125 European Championship. In February 2015, Maxime took part at his 2nd Enduropale Juniors with big goals, licensed to the Moto-club of Pecquencourt,. This was his first victory on 125 cm3. Perfectly prepared, under the colors of Motoland-Yamaha Racing Yamalube, Maxime is targeting the same season the Junior title and a top 5, or better, in EMX125. In July 2015, as part of the Junior World Championship in Spain, Maxime managed to win both races on the Yamaha YZ125 and became the Junior 125 World Champion! In 2017 Maxinm has joined Lovemytraining with big hopes and plans for the future.